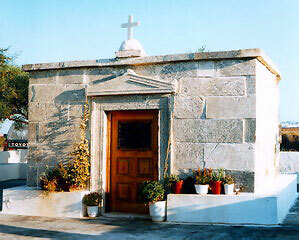 According to the inscription carved below the niche, the temple was dedicated as an offering to the Thea (goddess) Vasileia, and was used as a family tomb. The monument has now been converted into a Christian church, dedicated to St. Nicholas and has been called "Marmarites" (meaning marble) after the grey chiselled marble the temple is made of. The monument in the shape of a small, square building (4,18 x 3,59 meters) can be found just before the entrance of Emporio village.